We've reviewed 33 Sony TVs in the last 3 years. Sony TVs are generally a pretty safe bet. They tend to have great picture quality and a good amount of polish. Their build quality also tends to be better than average. Their budget models are not the most competitive TVs, but their high-end and especially their mid-range TVs are among the best, albeit usually at a price premium. Good Handling of Motion. 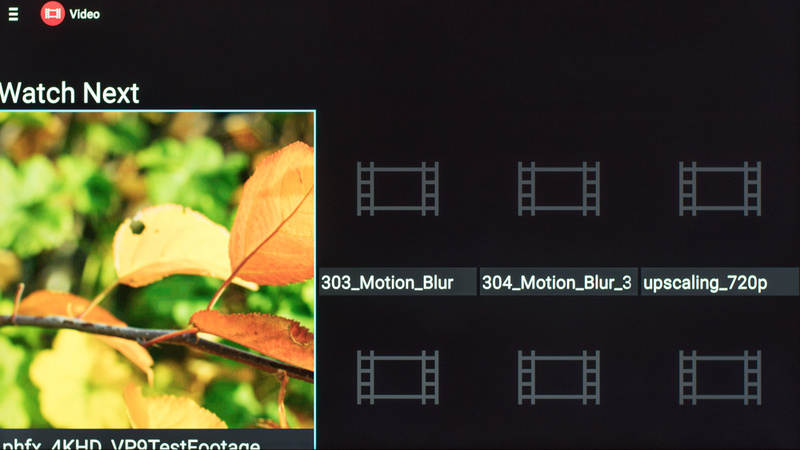 Sony, as a TV company, is a pioneer of motion features, and it shows. 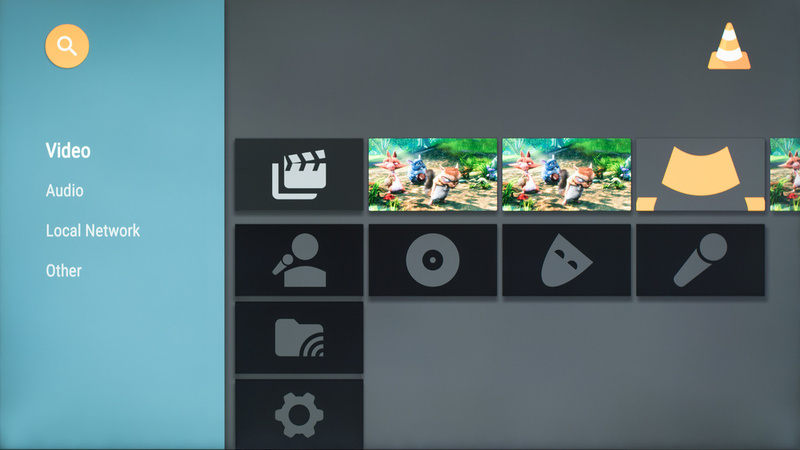 They usually have the best interpolation and most of their TVs have an image flicker feature to enhance motion clarity. Great Upscaling. Sony TVs, even the cheaper models, do better than average when it comes to upscaling lower resolution content. Sluggish Smart Features. 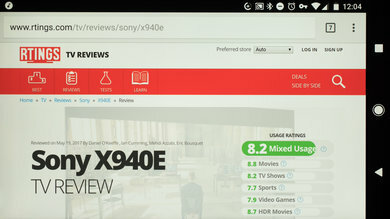 While Android TV itself isn't bad, and sluggishness is common with other brands, Sony TVs are prone to having common slowdowns while using their features. High Price. Sony TVs will most often be priced above their competition in their category. 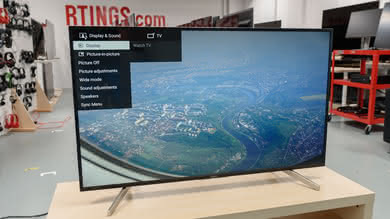 Samsung TVs have a picture quality comparable to Sony TVs, and in general, they are pretty competitive with each other. A big difference between the two is the physical build quality, especially with higher-end models. Sony TVs will generally have better picture quality than LG TVs. Even their IPS models, which use the same panels as LG, will tend to have better uniformity and get brighter. They both offer OLED models now, and LG offers the cheapest one, which is a plus. As a rule of thumb, it's pretty hard to be wrong when buying a Sony TV. Their more entry-level offerings aren't great, but any of the "Bravia" branded models (XBR model name) is a pretty safe bet. 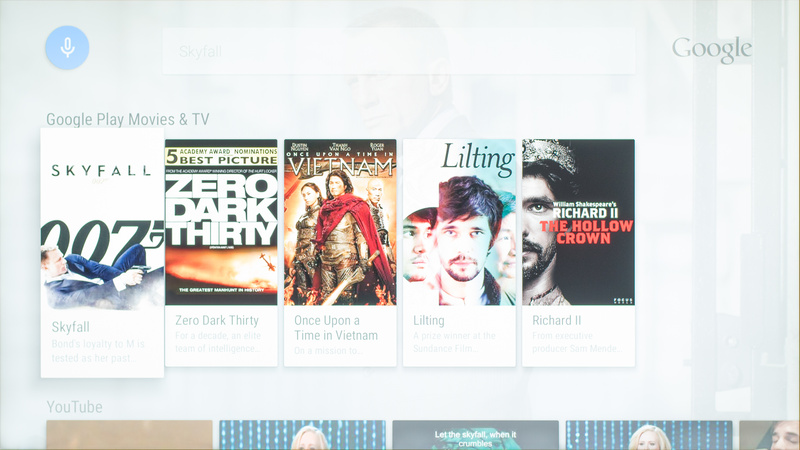 Their Android TV smart platform isn't the best, but it isn't bad either. You might end up paying a slight premium over competing models, but you'll usually end up with a good TV. Budget models will start with "KDL". The rest of the Sony range will start with "XBR". The first digits in the code are the size, the last 3 are the model. The higher the model number, the more expensive it will be. For example, XBR55X900F is a high-end 2018 55 inch model, while the KDL32W600D is a budget 2016 32 inch model. The best Sony TV we've reviewed is the A9F 4k OLED TV. 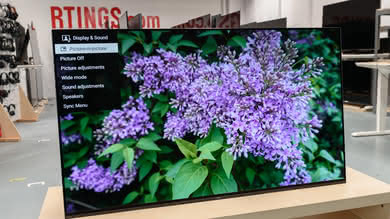 It has the best picture quality we've ever reviewed, similar to the LG C8 and LG B8, mostly thanks to its use of OLED technology. This allows the TV to reproduce perfectly deep and uniform blacks, giving it an infinite contrast ratio. In addition to its striking design and great picture quality, the A9F is a very versatile TV overall. It will do well with just about every usage, thanks to its great handling of motion, great viewing angles and great handling of reflections. Its ability to reproduce a wide gamut of colors also makes it a top performer for HDR, which is a more important feature nowadays. It's no slouch for gaming either; it has excellent low input lag and outstanding motion performance. The Sony X900F is a great mid-range 4k TV that performs very similarly to last years great X930E. It has an impressive picture quality, that looks great in a dark room due to the high native contrast ratio and full array local dimming. It has a wide color gamut and will produce bright and vivid highlights that look great in HDR. It has a fast response time and motion looks crisp which is great if you enjoy watching sports. It has a low input lag that will keep most games happy but unfortunately the viewing angles are narrow as with most VA panels. The Sony X900F will please most buyers that want a great TV but not break the bank. If you're looking for an entry-level Sony 4k HDR TV, the Sony X750F is the best one we've reviewed this year. It ports an IPS panel and thus has wider viewing angles, so it's well suited for a watching TV with a group of friend where some will be watching from the side. The Sony X750F has decent picture quality but performs poorly in a dark environments due to the low native contrast ratio that can't display deep blacks in dark rooms. It has good gray uniformity to please sports fans, but its brightness can not fight bright room glare. Unlike more expensive model the TV lacks a wide color gamut and its HDR capabilities are limited. Motion is good but the TV lacks some more advanced image processing capabilities like proper judder removal. In general it is a TV that will perform well in TV Shows, Sports, Video games and when used as a pc monitor but thanks also to the low input lag. 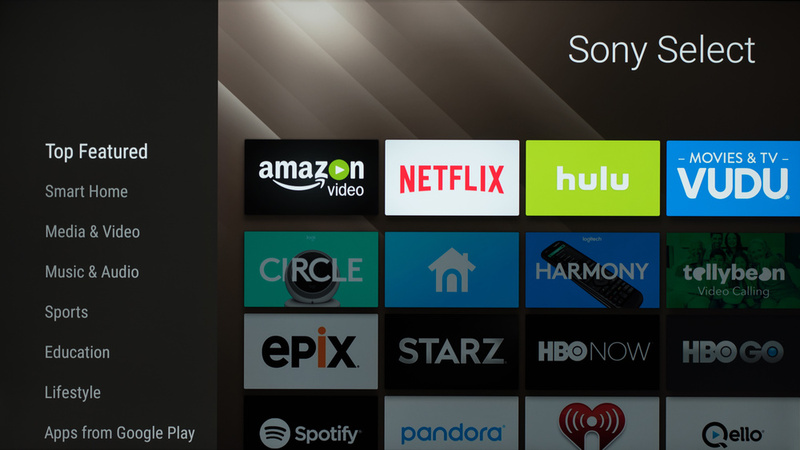 If you've ever used an Android phone or tablet, you'll find yourself to be surprisingly familiar with Sony's Android TV platform. It isn't the slickest available nor the fastest (although the latest version has improved considerably), but it is feature-packed and provides great interaction with mobile devices, making accessing content that much faster. While the interface itself hasn't changed much, the performance gradually improved over the year to a point where it's a bit less of an issue than it used to be. The interface is clean, and pretty simple to navigate. The top row is video and game content from YouTube, Crackle, and the Play Store. Below that is a row of ‘Featured’ apps. ‘Sony Select’ is a collection of apps and games Sony suggests downloading. It’s mostly basic stuff. 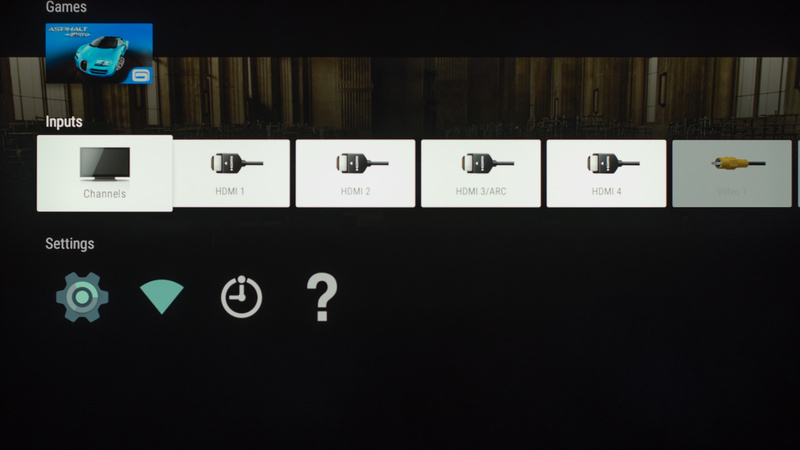 ‘Input’ is just the selection of whatever devices you have connected to your TV. 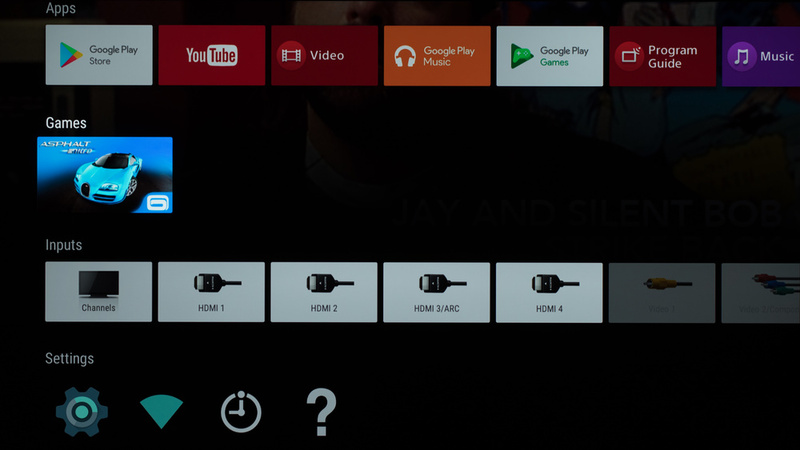 ‘Apps’ lists everything you have downloaded to your TV, as well as the Play Store. The Play Store selection is quite large. Because of the immense Android ecosystem, most popular apps are available, even some you wouldn't think of using on a TV. There is a 'Games' Row, too. It used to be separate to the play store, but it now just houses the installed apps that are tagged as games in the play store. 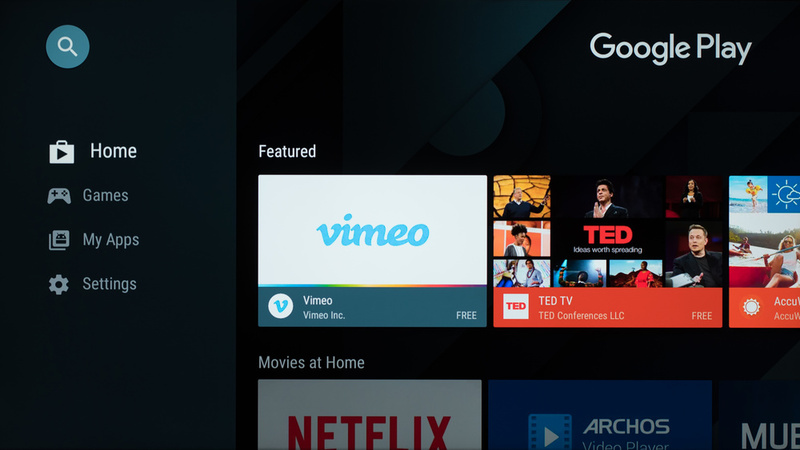 One area where the Android TV excels is with voice search. 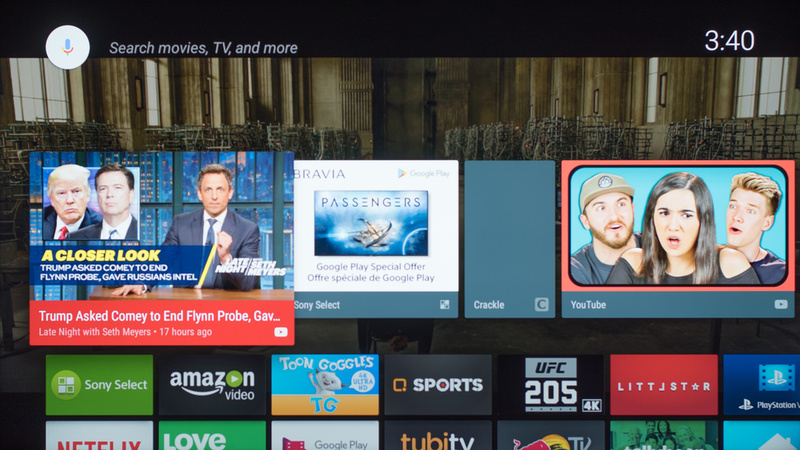 Press the voice search button on the remote and say what you’re looking for, and Android TV will deliver suggestions from the Play Store, Google Play Movies & TV, and YouTube, as well as relevant results from downloaded apps. 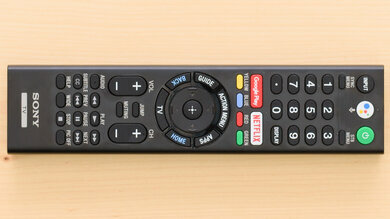 It’s a convenient way to navigate to content quickly, and it's often much faster than using the remote. It's also constantly being updated. After Android 7.0, it integrates with Google home and the Google assistant if you are logged in, which means stuff like news and weather is a few seconds away. It isn't quite as good for internal features as the Samsung voice search, which can execute commands such as "brightness" and "contrast" to adjust individual settings though, but the search is still what you'd expect of a Google service. USB playback is interesting on Android TV. The video player is decent and was able to play our video files just fine. The TV couldn't see any of our image files though (.jpg and .png), which wasn't great. It's also possible to download VLC. For the most part it works better than the stock app. There is some frame skipping with more demanding files. The only other browser available on the play store is TVWeb TV Browser. It is based on the Chromium web browser and scored 504 / 555 on the HTML5 test. Overall, while it is possible to use, it isn't worth the time and the experience is quite disappointing. Thankfully, even if the browser on the TV itself isn't any good, Android has a casting feature that allows you to mirror the screen of another device. You still need to scroll and move about using your computer or phone, which can be inconvenient, but it is still quite a bit faster and intuitive than using the included browser. Casting works even better for “Google Cast Ready” websites like YouTube, Netflix, HBO Go, and Plex as well as similar application on your mobile device. 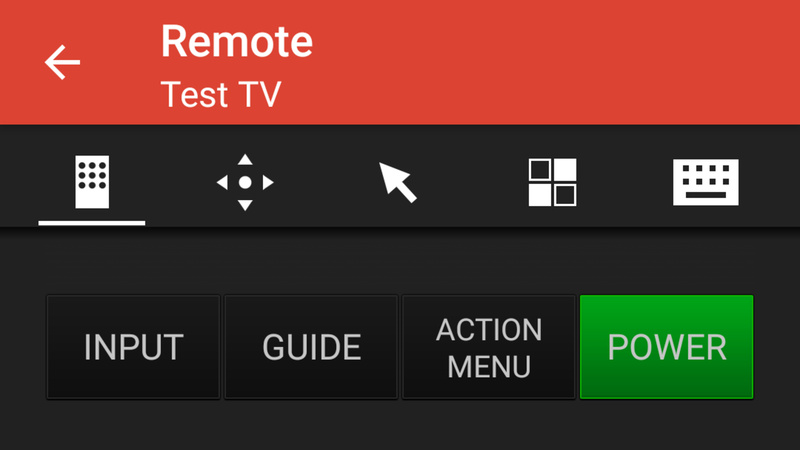 The remote included with Sony Android TV is very reminiscent of what used to be found with non-smart TVs. It features a full number pad, as well as a directional pad and player controls. 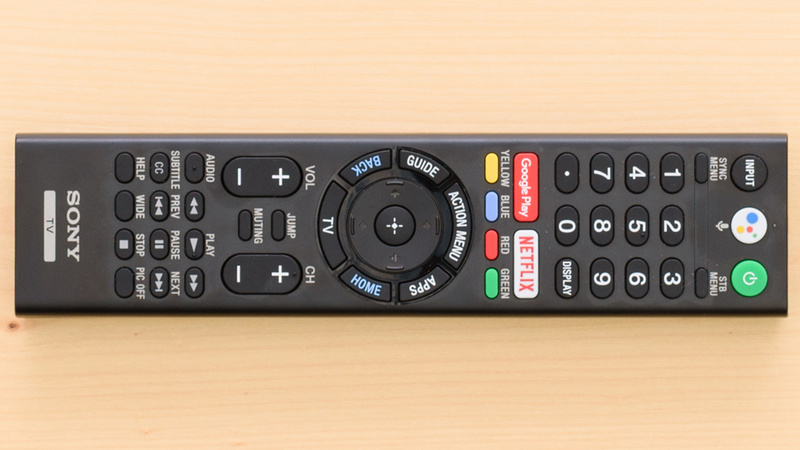 A lot of remotes nowadays omit number pad and even the player controls entirely and instead using on-screen controls and very simple remotes. It has quick access to both Netflix and Google Play Movies, and it features a microphone which lets you use the excellent Google voice search. It doesn't go as deep with the features as What Samsung does, but it is unmatched for recognition and is more akin to what you would find on an Android phone or through Google home. It can help you find content easily, or just get answers about general information like news or weather quickly. Models such as X900F feature a rubberized coating to protect from spills and crumbs, while the cheaper variants have a fully plastic layout with traditional rubber buttons. Flagship models such as the A9F and Z9F feature the rubber finish, but they also have a brushed metal back that give the remote a nice premium feel in the hand. 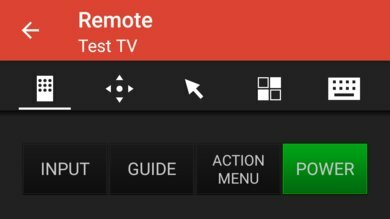 The remote app available for Sony Smart TVs, known as Video & TV Sideview, is not as good as many other remote apps like the TCL Roku App. It can control almost all aspects of the TV, including opening certain apps directly, and it can also work as a microphone for the voice control features. It can't stream files from your device to the TV. 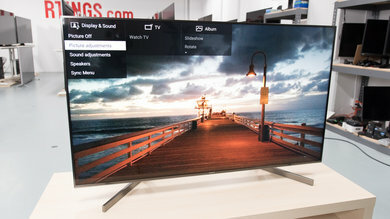 While they tend not to be the cheapest available, Sony produces great TVs. They'll generally be quite versatile, which helps with making them suitable for most people. The smart features aren't the most intuitive, but the overall package offered by their TVs is still better than average. At this point in time, it's fairly safe to say that their overall reputation holds true, and rare are the people that will find themselves disappointed by purchasing one of their TVs.